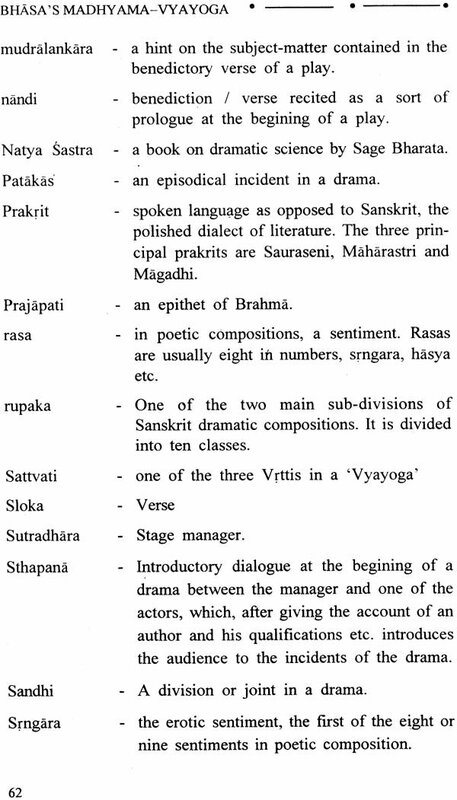 “The drams” of Bhasa have wrestled with and conquered time; and even if we cannot historically fit them in, they have an unmistable dramatic, if not poetic, quality, and this would make them deserve a place of their own in the history of the Sanskrit Drama. 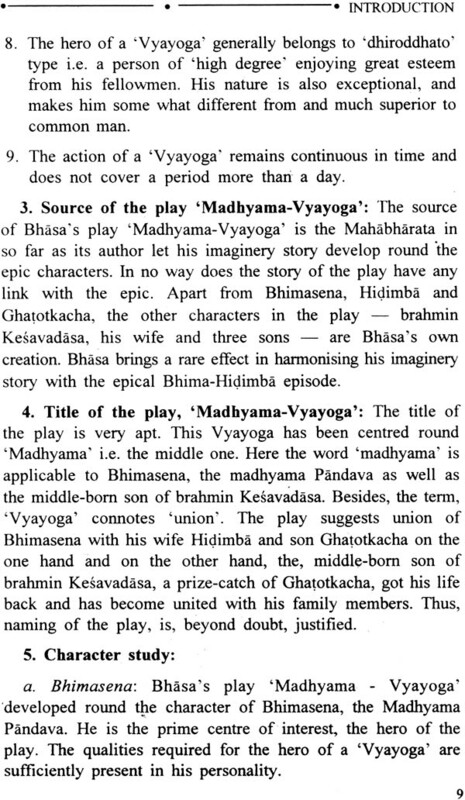 Though the play Madhyama Vyayoga (Family Reunion) is based on the epic Mahabharata or the Brahmana story of Sunahsepa, “What is original is the imagining of the situation out of the epic tale what appeals most to a student of Sanskrit drama (is its) rapidity of action directness of characterization and simplicity of diction the swift and smooth progress of the plot is seldom hindered by the profusion of description and emotional stanzas and monostich are freely employed. Bhasa achieves something unique within the narrow campus of this slim one Act play. Born in 1959, Sudha Battacharjee, graduated with Honours in Sanskrit from Dibrugrah University, Assam. She did her Masters in Sanskrit literature (Darasana) from Visva Bharti University, Santiniketan, in 1982. Since then, she has been serving the Department of Sanskrit Women’s College her alma mater in Tinsukia Town of Assam. Mrs. Sudha hailed from a family of Sanskrit Scholars. She is the granddaughter of Late Dayal Krishna Tarkatirtha, author of Anuman Chintamoni among other books. Her father L./D.C. Battacharjee (Tarkatirtha) was also a scholar patron of Sanskrit learning. The world today is moving faster towards assimilating very many trends and tendencies, ideas and philosophies. Works of translation help a great deals in achieving this unity in diversity. It is in this direction, the present work of rendering Bhasa one of the makers of Indian literature in its classical phase into a foreign tongue enthused my interest. The other reason for taking up of Bhasa’s play for translation is that his plays suit modern man’s taste and time. Bhasa blazed a new trail in that remote past by introducing one Act Plays. This has come to stay as one of the popular medium of performing art in later times. Bhasa strikes a modern note in his easy, unaffected style and in psychological subtlety; he is universal when he recognizes the uniqueness of human beings of flesh and blood sufficiently individualized. I have attempted to give a running translation of Sanskrit text and care has been taken to remain faithful to the text. And in doing so I have been faced with what all translators of Sanskrit generally experience i.e. the difficulty of giving suitable synonyms for Sanskrit in English. Moreover, the unique beauty of a language like Sanskrit cannot be brought up to its full in translation. I have retained some Sanskrit words in English translation ver batim. However I tried to provide English equivalent for these words either in y runn in translation or in the glossary section of the book. This has been done with a view to getting rid of any confusion in the way of its understanding especially by the English readers. I have tagged an introduction wherein I tried to trace the Bhasa controversy along with different facets of the play in brief. I claim no originally because I tried to harness within my limited scope the opinion of famed scholars on the age and works of Bhasa. A Bibliography has also been provided. I take the opportunity to dedicate this maiden work of mine to the memory of my revered grandfather Late Dayal Krishna Tarkatirtha, and eminent Sanskrti pundit of north east india, much known for his researches in the Nyaya philosophy. To my publisher, Bharatiaya Vidya Bhawan and Sri S. Ramakrishnan. Executive Secretary and General Editor, my debt is great. They not only have published the book but also devised a better shape and style by getting it edited. I also express my gratefulness to Chaukhamba Vidya Bhavan of Benaras. It is from the Sixth edition of their book Bhasa Nataka Chkre Madhyama Vyayoga I based my English translation. I record my warm thanks and gratefulness to Sri A.H. Mazumder, M.A. (doub), Head Department of English, L.R. College, Lala, for his help in going through the proofs. I am also grateful to Sri M.R. Sinha, M.A, Principal, L.R. College and, to Mrs. Chitra Bhattacharjee, M.A, Head Deptt. Of Sanskrit, Women’s College Tinsukia for their affectionate encouragements. I feel delighted as I recall the good services of my family members while preparing this book. My husband Sri Ratnasekhar Bhattacharjee, M.A Sr. Lecturer, English, L. R. College, Lala Hailakandi, offered his continuous support and all out help as and when I so required. The book is intended mainly for the readers who are unfamiliar to Sanskrit language and for those students having this play in their college/university syllabus. If it benefits them in any manner I feel my labour refreshingly rewarded. Finally, imperfection creep in, knowingly and unknowingly. These will be removed in the next edition, if called for. Nothing definite has been known as to the place of birth or the age of Bhasa. Materials available in the way of references, hypothesis etc. confirm the fact that bhasa is a pre-kalidasic dramatist. 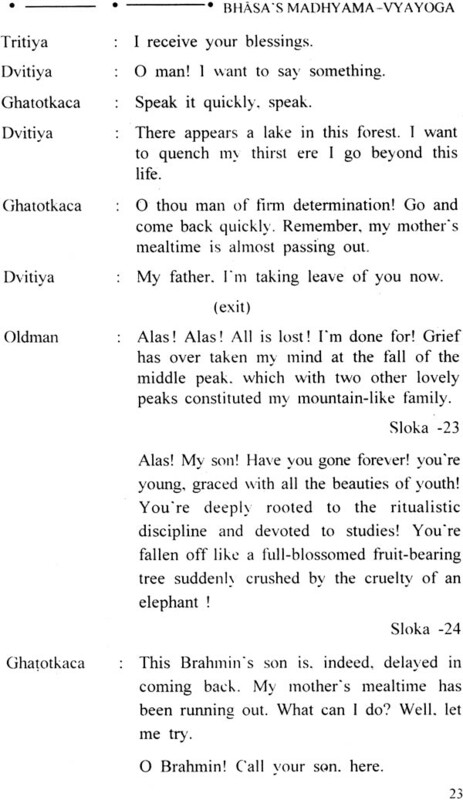 Kalidasa and Bana spoke high of their predecessor. In the prologue of his play Malavikagnimitra, Kalidasa profusely showered his tribute to bhasa in the following manner. How come the age set its heat on the production of a living contemporary poet Kalidasa when works by such poets of renown as Bhasa, Saumilla, Kaviputra et al are being available. 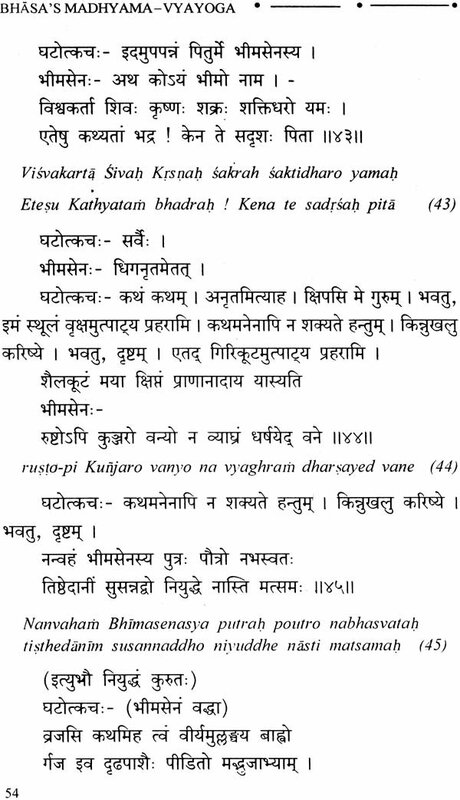 It appears that Kalidasathe greatest poet, acknowledged Bhasa as a past master of Sanskrit dramatic art Bhasa’s name figured in the introductory verse 16 of Banas Harsa Carita. Poet Bana speaks of Bhasa as a dramatist of distinction. The fame of Bhasa rests on his dramas beginning with Sutradhara endowed with many bhumikas and flourished with patakas as if these were like so many temples. Later poets like Jayadeva spoke o fBhasa in high terms. He hailed Bhasa as Kavikulaguru. The inspirer of the muse of poets or a teacher of poets. 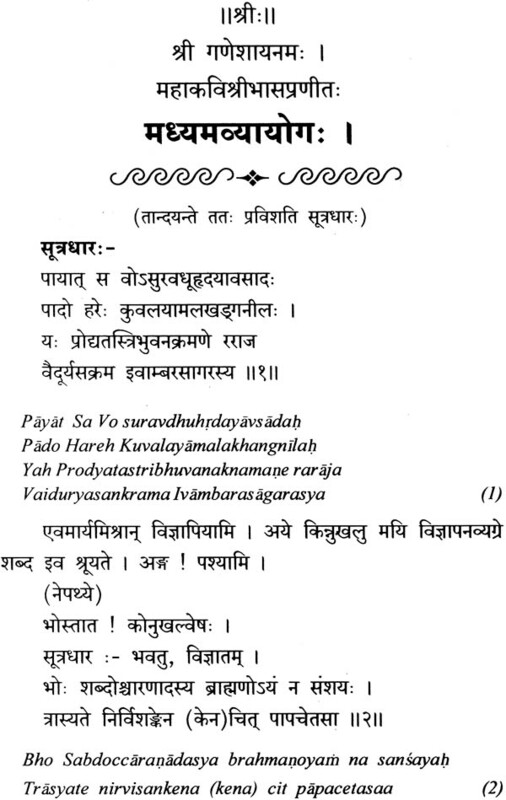 Vakpati in his Gaudavaho mentioned Bhasa in verse 800. Celebrated rhetoricians like vamaha, Dandin, Abhinavagupta, Rajasekhara spoke of Bhasa in terms of appreciation. Among others who made mention of Bhasa’s Svapnavasavadatta were Bhojadeva. Saradatanay, Sarvananda, Ramchandra Gunachandra, Sagaranandi et al. A turning point has been reached in the beginning of the second decade of twentieth century (1912-1915) when T. Ganapati Shastri, a Trivadrum based Sanskrit Pundit of repute edited and published thirteen plays of anonymous authorship but which on account of their characteristic affinities verbal, structural, stylictic and idealistic he ascribed to Bhasa who so far had been known only by reputation. 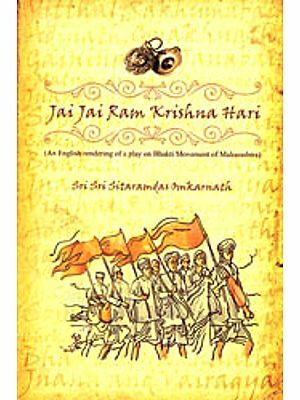 The recovery of the long-lost plays of Bhasa and their subsequent publication though a landmark for the history of Sanskrit dramatic literature yet it invited a storm of controversy, because the manuscripts of the thirteen plays bear o name of T. Ganapati Sahstri that the plays were written by Bhasa while scholars of eminence like Ramavatar Sharma. L.D. Burnett. Bhattanath Svamin, K.R. Pisharoti, Hirendranath Shastri expressed their doubts in the matter of Ganapati Shastri’s thesis attributing the authorship of the plays to Bhasa. However, sober view demands that until further light has been shed and thing acceptable come up there should be no hesitation in attributing the authorship of the plays to Bhasa.